ELYRIA, OH (WOIO) - Firefighters say in an emergency, bystanders have the best opportunity to save the most lives. It may take less than five minutes for emergency responders to arrive but that can still be too late. So staff members in Elyria Schools will be better prepared to deal to jump into action if there's a massive tragedy. 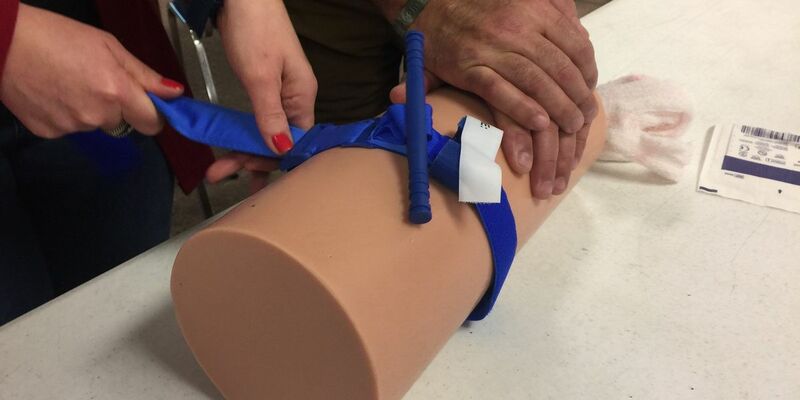 Thursday members of MetroHealth's trauma department conducted A "Stop the Bleed Day" workshop where they taught teachers the basics. The national campaign, Stop the Bleed, was launched in October 2015 by the White House as a call to action. After the school shooting in Sandy Hook, this became a national initiative with medical professionals training bystanders all over the country. According to the organization, the top cause of preventable death in trauma is bleeding. 20 percent of people who have died from traumatic injuries could have survived with quick bleeding control. "Nobody should die from uncontrolled bleeding when it's a preventable death and empowering and enabling immediate responders to intervene before the first responders can arrive," Christina Ragone, Trauma Program Manager at MetroHealth said. Using tourniquets, the MetroHealth staff showed the teachers quick techniques to pause blood flow. The goal is to empower and encourage people to get involved and stop the bleeding before first responders arrive. They say, anyone can learn. "This is something we can use not only in our classroom but we could use it in a car accident, at the store, at church, that this something at school but it could also help any number of people," teacher Heather Hale said. National Stop The Bleed Day is Saturday, March 31.